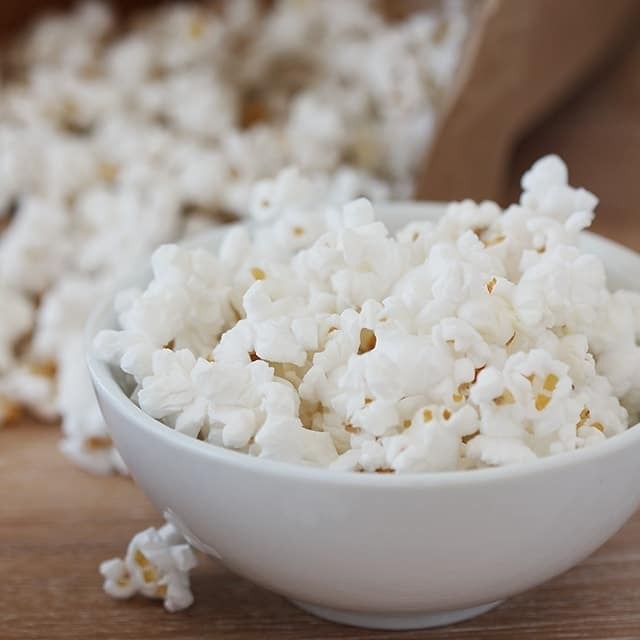 Top tips for making your own air popped popcorn, in a brown paper bag! I remember the day I read in my local newspaper that you didn’t need commercially produced “Microwave popcorn” to make microwave popcorn. It was 2007, my kids were small, and I didn’t have an air popper to make air popped popcorn. I remember the ah-ha moment as if it were yesterday! I already wasn’t buying microwave popcorn. Not because I was too concerned about all the chemicals that were in it, although it didn’t help, I just thought it was a rip-off! I knew I could buy a lot of kernels for a lot less money than a box of popcorn. Plus, I loved the taste of real butter on popcorn, and not the chemical version of popcorn. I couldn’t believe I had never tried making microwave popcorn in a paper bag on my own before! It’s as if I thought the commercial makers of the microwave popcorn had some special popcorn popping ingredients to make it happen. Since microwaving air popped popcorn in my own brown paper bag, I’ve learned a lot about how to make popcorn perfectly, without burning a single kernel! Pour 1/3 cup popcorn into one brown paper lunch sack. Fold the top of the bag over twice to seal in the ingredients. Cook in the microwave at full power for 2 1/2 to 3 minutes or until you hear a pause of about 2 seconds between pops. I can’t say that I’ve tried all the popcorn kernels on the market, but I can say I’ve tried some terrible ones! Commercially sold kernels, depending on the type of seed they start with, really can vary on their ability to pop all the kernels and the taste the way you like it. So, experiment with different kernels before you settle on your family’s favorite. Also, if your kernels are old or stale, it’s ability to get successful air popped popcorn will be compromised! The great thing about the paper bag method over an air popper is the amount! You don’t need that much popcorn, so the brown bag is great for 1 serving. Tip #2 though, is don’t overfill the bag. It will lead to burned kernels or kernels that are stuck too close to each other and can’t pop properly. For the perfect amount of air popped popcorn, we use 1/4 cup to 1/3 cup at the most. No more than 1/2 cup of kernels. This is different for different microwaves and amounts, so you’ll have to test your own. On average, the perfect time for my microwave is 2 minutes with 1/4 cup of kernels. Don’t trust the microwave setting for popcorn. Instead, listen to the slowing down of the air popped popcorn popping. Once there is 2-3 seconds between pops, it’s a good time to take it out. Tip 4: The right toppings! 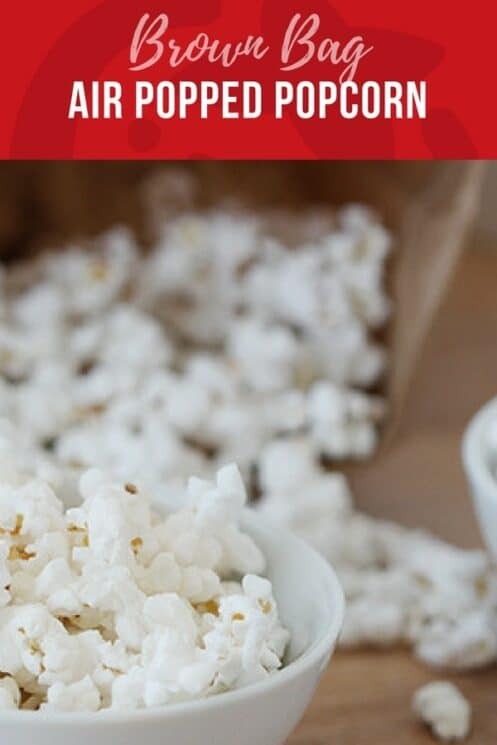 The best part about the natural, nothing added air popped popcorn, is that then you can add the perfect toppings without competing with the pre-seasoned and pre-flavored commercial popcorn. You can create savory or sweet, and add your own fresh ingredients like real butter! We even enjoy popcorn included in our trail mix or granola. Tip 5: Share with your kids! At this point, it’s tempting to keep all the popcorn for yourself! Get yourself a huge package of brown paper bags, and a large container of popcorn kernels and let your kids have their own bags. 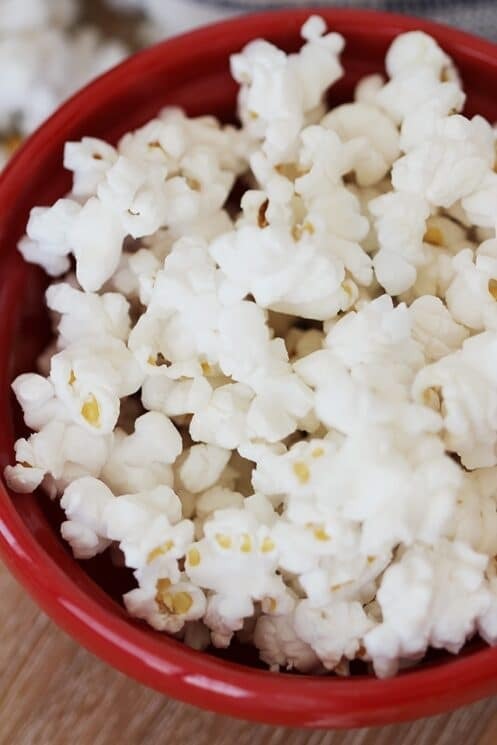 Popcorn is a great snack for kids! 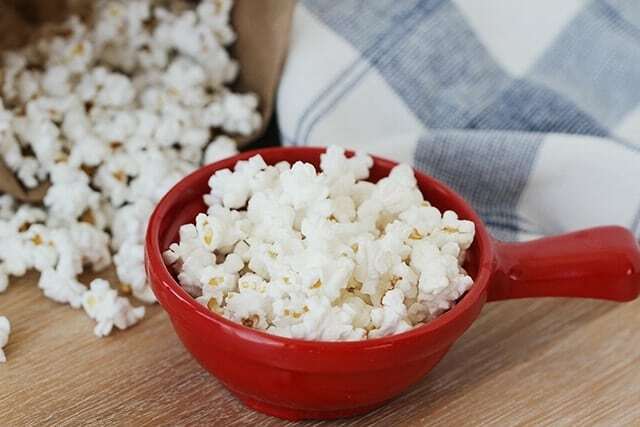 Popcorn is a whole grain, which means you get fiber and vitamins in each kernel! It’s satisfying and delicious. Repeat with the remaining popcorn kernels. Are there any particular brands of popcorn you can recommend? The video says the brand makes a huge difference. What brand should I buy in Canada? Would be nice if you tell su the best brand of popcorn to buy please. i add melted butter once its cooked…. quick and delicious! 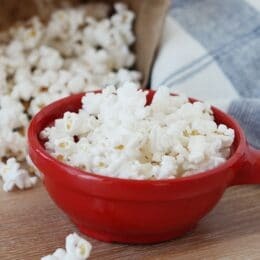 Where can I buy the best fresh popcorn that I know won’t be stale or old? Hi Dawn! There are a few ways you can look for fresh kernels. First, look for kernels that are plump and smooth, not shriveled or dented. Check the expiration date on the package. And buy from a store that has high turnover. Wishing you tasty popcorn!